MONTREAL -- The Quebec government is trying to impose a rigid and outdated taxi model on Uber's flexible way of doing business and if nothing changes, the ride-hailing company will disappear from the province's roads by mid-October, the company warned Tuesday. 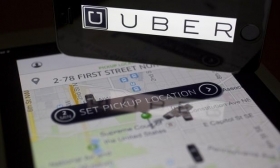 The province already had the most "severe" rules regulating the ride-hailing company in Canada, Uber's Quebec general manager Jean-Nicolas Guillemette said. Forcing all Uber drivers to undergo a mandatory 35 hours of training, as Transport Minister Laurent Lessard announced Sept. 22, will make it impossible for the San Francisco-based company to continue its operations in Quebec beyond Oct. 14, Guillemette added. "The vast majority of our drivers are part-time," Guillemette told a Montreal news conference. Drivers often test out the service for a few hours to see if it works for them. Forcing them to be trained for 35 hours before they can try the Uber platform destroys the firm's business model, he said. "This is the beauty of the Uber platform — it's the flexibility that the driver-partners have to come and go and decide when they want to drive," Guillemette said. Last year, Quebec signed an agreement with Uber on a one-year pilot project allowing the company to operate in the province — despite heavy opposition from the traditional taxi industry. The agreement allowed for a one-year extension; after that, the legislature would have to adopt a new law to permit the company to continue operating. Taxi drivers have been incensed with Uber ever since its entry into the market because for decades, the government had limited the number of taxi permits in each city in the province. The provincial government hasn't responded to Uber's ultimatum. Gabriel Nadeau-Dubois, a co-spokesman for Quebec's fourth party, left-leaning Quebec solidaire, called Guillemette's position, "blackmail." "If Uber wants to leave Quebec, the reaction of Quebec solidaire is 'good riddance'," said Nadeau-Dubois, whose party is close to organized labour.